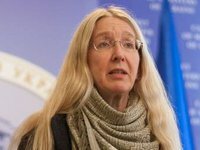 All contracts procure medicines using 2016 budget funds have been signed and tenders have been announced, acting Health Minister Ulana Suprun said at a press conference on Wednesday. She said that by the end of January the Health Ministry intends to submit the list of procurement using 2017 budget funds to Ukraine's Cabinet of Ministers for approval and the funds to finance the procurement could arrive in March. Suprun added that in 2017 in 2017 procurement tenders using 2016 and 2017 budget funds will be conducted. Patients of Ukraine charitable foundation head Dmytro Sherembei said that procurement via international organizations helped to save around 5,000 lives of patients who were able to have treatment. He also said that the nerve storm around procurement by international organizations is protection of capital. He also said that there is resistance to procurement by international organizations from chief doctors of clinics. "They sat in their rooms and divided budgets of hospitals, as they were also involved in procurement. Now they would have to cut their prices to the level of prices of procurement by international organizations," he said. "Todurov [Director General of Heart Center of the Health Ministry Borys Todurov] would have to spend all UAH 140 million allocated to the Heart Center via the ProZorro [e-procurement] system. We will monitor each kopeck," he said. Head of Parents for Vaccination charitable foundation Tymofiy Badikov said that in the regions there is huge resistance at the hospitals that plan to hold procurement tenders via the ProZorro system.